The following occurred last Monday. If you’re a parent, then I’m sure you can relate! After waking up, I gulped down some coffee, got myself breakfast, jumped in the shower, woke up my seven-year-old who can’t wake up without a bullhorn in her face, handed bowls of cereal to both kids, made sure they had lunches and a mid-morning snack, packed my own lunch, kissed the kids, my husband, and the cat (wait, no I didn’t kiss the cat) goodbye, and drove 30 minutes to work. Once I got to work, I worked. You know, computer stuff. Worky-work stuff. I take a 45 minute yogilates class at noon on Mondays. It’s a blend of yoga and pilates. Technically, this time is “mine” although 1) I don’t enjoy it, 2) my instructor was formerly a drill sergeant I’m pretty sure and 3) I don’t enjoy it. But it’s just down the hall from my office and it’s only $5/class. I sort of have to take it! At some point, an email arrives from my seven-year-old’s school. It’s full of 37 reminders about what we parents need to do to “celebrate” March is Reading month: track reading minutes, fundraise, send in gently used books, send in money for the book fair, attend the “fun” school dance, buy carnival tickets, send in jokes for March is Reading Month (who knows why! ), order lunch for the reading celebration, etc. And ETC. I also get an email from the school district that the last day to turn in your child’s art for the city’s art contest is today. I have forgotten the art at home and it has to be turned into the school by 4pm. I would have to race home after work, retrieve the art, and be the last person to arrive at pick-up in order to turn in the art that my youngest really wanted to turn in for the contest. Between you and me, I know she can’t win. Won’t win. So maybe I don’t turn it in and just tell her I did? Nope. I throw on my Super Mom cape, race home when I’m finished working at 3:10 (I work part-time), retrieve the art, race back to the school and turn it in. Yes, I was the last mom at school pick-up. But I turned in her art for the contest AND picked up my kids. I made it! After I picked up the kids, we race home to get a snack and do some homework before my oldest’s eye doctor appointment. I coordinate a playdate for my youngest so she doesn’t have to go to the optometrist. After dropping her at the playdate, I drive my son 30 minutes to his appointment. At the doctor’s office, I am given 47 “new patient” forms even though he’s been there 5 times in the last year. Updates, they say. It was now 5:15 p.m. What? They wanted to know WHAT? 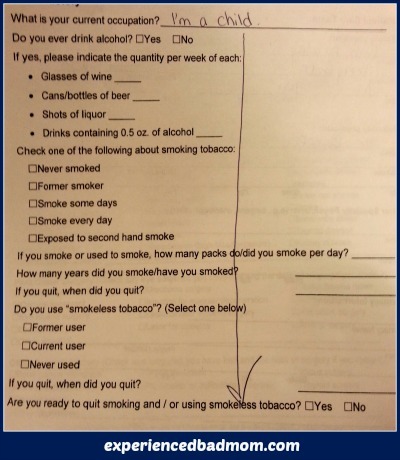 “I’m a child,” I merrily wrote on the new patient form asking for my child’s employment, drinking and smoking habits. After the appointment, it’s a 30 minute drive home before I had to feed everyone dinner (which at least 1 of my 2 kids would despise). Then, with my husband, I tag team supervising first grade homework and getting my son to a Boy Scout meeting at 7:30. By the time my husband and son get home from Boy Scouts, I’m already in my jammies and planning what to make for lunches the next day. I think I fell into bed at 10:30. I’m pretty sure our ten-year-old was still up finishing his mandatory 30-minutes of reading for school. My husband was asleep in the LaZBoy with the TV on. That was last Monday. Who knows what this Monday will bring? Although I’m willing to bet it will be similar! How are things on your Monday? Your day sounds exhausting. I’m amused at how “celebrate” is code for “do a bunch of stuff that you don’t really have time to do but do anyway because who wants to be the one parent who doesn’t participate.” Let’s make it sound fun, though! Silly “March is Reading Month”. You’re so right. They make it sound like a celebration, rather than extra work, and woe to the parent who actually complains! Or fails at all the requirements for the “celebration”! The time change has us all messed up! We are constantly running late! Let’s banish Daylight Saving Time!!! Oh. My. Word! 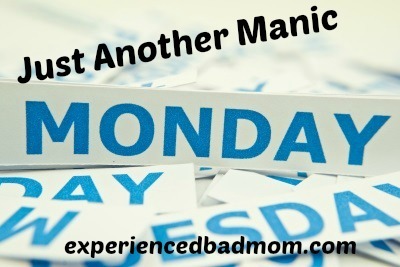 I totally forgot that last Monday was right after Daylight Savings Time. I should get extra brownie points AND revise my post! Another reason my Monday was manic. I love your response on the eye DR form – I always think those forms are so tedious!! You are a rockstar mom to go home and get the art work – I probably wouldn’t have been so nice. We can do it! You just do it, don’t you? See, now it’s Tuesday already. Thanks for commenting! Typical Monday for me too! I was laughing so hard when I read your response on the doctor’s form though…that was the best!